The Prowler is a movie that works strictly with mood and suspense. Many of the slasher films from the 80's relied heavily on gore and high body counts alone. 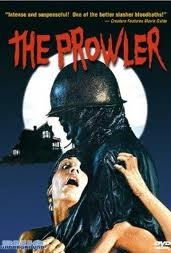 Although The Prowler doesn't lack in it's fair share of blood and guts, this film is deeper than most of the slasher films to come out of the eighties. It is also a film that many horror fans - particularly slasher fans - adore. Of course I don't have stats to prove this, just recollections of the many podcasts, blogs and websites I've read and listened to through the years. The script is co-written by Glenn Leopold and Neal F. Barbera. The duo take the time to actually develop the characters, something not common in slasher films. We get to know the central characters, because we linger with them for most of the film, while they're trying to figure out the mystery of just who is killing the teenagers around them. A World War 1 veteran receives a Dear John Letter from his love, Rosemary. It seems that she's move along swiftly, while our killer is still fighting the battle. Very early on in the film we get to see exactly what we're in for. After some stock footage of soldiers returning from the war, we cut to a graduation party where Rosemary (Joy Glaccum) and her lover end up out on the Gazebo. A killer stalks in the shadows as he watches the two lovers make out under the stars. He disposes of them rather quickly with a pitch fork - an instrument of death used constantly in this movie. Fast forward thirty-five years later. Another annual graduation dance is in the works. Naturally, some have reservations since that fateful night back in 1945 when Rosemary and her lover were killed. The killer has never been apprehended. Vicky Dawson plays Pam MacDonald, the survivor girl. Although Pam isn't as tough, this character reminds me of Ginny from Friday Part 2. There is just something about they way they handled themselves in these films. Both very strong personalities and ready for a fight when confronted with one. For most of the film she pals around with Mark London (Christopher Goutman). The two are working together, while simultaneously being stalked by the killer. And that brings me to the main character of the film: The Killer. He's pretty basic. Dressed in World War 11 fatigues, his face is covered and most of the time he's obscured by the shadows. His weapons of choice are mainly the pitchfork and Bayonet. For the majority of the film this character was played by the assistant director, Peter Guiliano. Tom Savini handled the special FX work on the film. Slasher fans, myself included, love gore and great, inventive kills when it comes to our horror films. Savini delivers and delivers some more in this one. One of the victims gets a bayonet through the top of his head, which protrudes out of the bottom of his chin. While convulsing, the victims eyes turn upward into his skull and bulged out. This kill is so effective and one that gets me every time. Another effective sequence is when Lisa (Cindy Weintraub) decides to take a swim because she's angry that her boyfriend is drunk back at the party. After she finishes her nightly swim she tries to exit the pool but is kicked in the face by the killer. It is said that this take alone took 18 times to master. Lisa is in a state of confusion and is grabbed from behind as the killer slices her throat. Much like an earlier kill in the very first Friday film, this throat slice doesn't look as sloppy and really makes you cringe as the bayonet slices back and forth like a violin bow. Is this Savini's best work? I'd say it ranks up there with his other films, Friday the 13th Part 4: The Final Chapter, The Burning and Maniac. Director, Joseph Zito, does a great job with the pacing. As I've said before the suspense and tension build to a boil. There are long, quiet, brooding moments. And in these moments there are little snippets of the killer, a frame or two, while other action is taking place. In another scene Pam tries to escape through a door but the latch won't open. The camera holds as we see the killer stalk in the background. This is very effective. Zito holds the shot at just the right length - not too long or short - that builds that tension until Pam can finally escape into the night. Richard Einhorn's score does exactly what it's supposed to do. It isn't jarring and obnoxious; taking away from the scene, but creates the mood that helps build the suspense. Key moments in the music happen when you least expect them. Those sharp chords ring out; causing the viewer's emotion to be dictated momentarily. During the chase scenes the score really comes to life; that underlying sound scape of mood and atmosphere. The Prowler resonates to this day because of the talent behind the film. Filmmaking with a small budget sometimes forces artist to go beyond their normal capacity. I'm sure Zito and company had no idea in 1981 that his little film would be so adored years later. But that is why film is so powerful. Some are forgettable while others last the test of time.